Anyone who doubts the popularity of the Dave Matthews Band look no further than these amazing statistics: their albums routinely debut at the top of the Billboard chart and they sell out shows in record time, yet they are without a number one single through six studio albums. Only 1996's Crash Into Me (from the album Crash) has come close to topping the charts. Dave Matthews Band are talented musicians with electrifying presence both on stage and off, and most importantly they make music that is perhaps the most universally appealing of any available today. 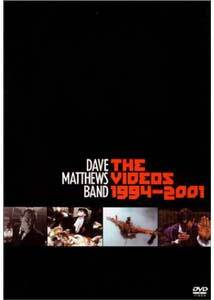 Dave Matthews Band: The Videos 1994-2001 is a complete look at each music video produced by the band since their inception. The first video produced by the band with the help of director David Hogan, What Would You Say is easily the looniest video on the disc. Blending performances shot in color and black & white, the video offers up striking imagery, most notably singing heads and dancers covered in body paint. Overall a nice first video. Director Hogan returns for a performance based video that conveys the meaning of the song as the main character goes through a typical day on a New York street. Quickly paced and often hard to follow this video could have been better considering the song is one of DMB's best. Certainly one of my tope five DMB songs this video is possibly the best of the Under The Table and Dreaming offerings. Director Wayne Isham offers a nicely done video with help from former Roseanne star Johnny Galecki. A beautifully shot clip features the band in the midst of a heavy autumn as leaves adorn the ground and their music fills the air. I may be biased because of my love for the song, but this video ranks as one of the best in the collection. The first of four clips from the Crash album, Too Much is also the least involving video in the collection. Aside from creative camera angles and costumes this song (and video) fails to hold the viewer's attention despite its upbeat tempo. The video is largely performance based. As So Much To Say closes, Matthew's sings the lyric "Open up my mind and let me out". In many ways this video, directed by Ken Fox, is a trip into the psyche of Dave Matthews. Shot on two sets, one a crude mock up of a jail cell at a mental ward, this video isn't the flashiest and that is its best quality. A good song to boot this one slides by on its production aspects. The only video featuring only live performance footage on the disc, this video conveys the energy present at a DMB show. The song is catchy, though not a big radio hit, and the video works. Shot on location in upstate New York, Crash Into Me was the band's biggest hit, and best known video. With striking visual images ranging from bassist Stefan Lessard playing a submerged classic bass to a mix of still images and frame by frame captured images this video is easily the most stylish of the group. Easily my least favorite video and song by DMB, Don't Drink The Water is also the most mind-boggling. Does this video make any sense at all? No, not really. Though the imagery is at times amazing, and the song has a catchy chorus, neither is very good as a whole. The most jubilant of the collection Stay offers up imagery of a southern celebration to go along with the upbeat tempo of the song. Though I am not entirely sure of just what the purpose of the video is, I like it. It is a video I for one would like to be trapped in. My favorite DMB video and my second favorite DMB song, Crush just oozes cool. Echoing the songs laid back attitude the video presents the band in a smoke filled lounge shot in black & white. The video is expertly made in its camera work and atmosphere. A sort of strange Alice In Wonderland feel accompanies this video directed by David Meyers. With its use of vibrant colors and odd sets, I Did It marks a change in direction for DMB as the clip is more centered on concept and story. The most recent clip by the band and best off of the album Everyday, the look of this video is fine though the concept seems off. The song, about love and time spent apart, is eloquent in its approach though the video fails to convey that message. Image Transfer Review: Featuring each video in a full-frame image, BMG offers up a visually striking palette. Colors on each video are vibrant and clean with no bleeding, and black levels are fine as well. No edge enhancement can be seen, and sharpness and detail are fine as well. Audio Transfer Review: Presented in PCM 2-channel as well as Dolby Digital 5.1, the latter creates a splendid sound field. While not gimmicky the mix does envelop the room with its beautifully reproduced music. The left and right speakers come across cleanly and the center channel sounds fine with no hiss or distortion. Extras Review: A collection of commentary tracks by each video director leads off an impressive list of extra features. Directors get four to five minutes to offer their thoughts on the clips, though most talk about working with the band. Given the fact that each clip is short, it fails to allow the directors to go more into detail about the concepts behind the videos. Three making-of featurettes for the videos Stay, Don't Drink The Water, and I Did It are available from the extra features screen. These are brief, enjoyable shorts that show what fun it must be to hang out with DMB. Song lyrics are also included, and my are they helpful. If you are a fan of DMB then this disc is a must buy. If you aren't, well there is enough here to justify a purchase regardless. I am all for video collections appearing on DVD, now if we could just get Staind, Incubus, Weezer, and Radiohead to follow suit the world would be a better place.